John Deere construction equipment offers operators the ability to complete tasks easily and efficiently when taking advantage of a variety of features. 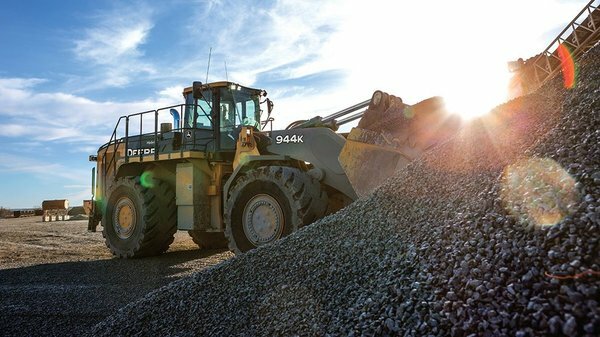 For example, the John Deere 944K Hybrid Wheel Loader includes a hybrid drive system that maximizes the productivity of the machine itself. When used correctly, the capabilities of this machine are astounding, from having the ability to recover energy from wheel motors to being able to perform quick direction changes without the use of service brakes. Watch the videos below to learn more about the 944K, its capacity, and what operators must do to ensure maximum production. In order to ensure the 944K is being used to the best of its ability, operators should take certain tips into consideration when driving. These include making boom raise commands when coasting or making direction changes, which should be made while the operator’s foot is held to 100% command. Other important things to consider, especially in regards to long-term costs, are making sure to limit the use of the service brake and avoiding idle time. The 944K’s control layout is very similar to that of other K-series wheel loaders, with the exception of the accelerator pedal control on the 944K, which will automatically control the speed of the vehicle depending on the load. In addition to this automation, this machine also includes four speed ranges, quick shift settings, normal/production/performance settings, and coast control. Ensuring efficiency and a long life for the 944K means performing daily checks; maintenance steps and locations are laid out clearly on the machine itself as well as within the operator’s manual. While conducting these inspections, operators will begin with checking the hydraulic oil level and finish with inspecting the FLOD seals at the boom to bucket connections. Once daily checks are completed and the machine is powered on, the operator may perform additional checks in the monitor. These checks can include the tire pressure monitoring system, the auto lube grease level, a park brake test, and a boom height kick-out. We hoped you enjoyed learning about the John Deere 944K and how to ensure that it runs to the best of its ability to help you get the job done. To learn even more, contact your local John Deere dealer.